We’re continuing our series of chef’s favorite recipes from independent hotels across the country. Because it’s fall, when a nice thing to do is gather your friends indoors and serve a hearty meat dish with good wine, we’ve chosen Coriander Crusted Lamb Rack with Foie Gras Stuffed Prunes and Port Wine Reduction. We love this rich, savory-sweet dish from Chef Jason Tilman at The Strand Hotel: it’s a generous centerpiece to a dinner party, it’s easy to make at home, and the delicious smell from the oven will make you absolutely certain all’s well with the world. 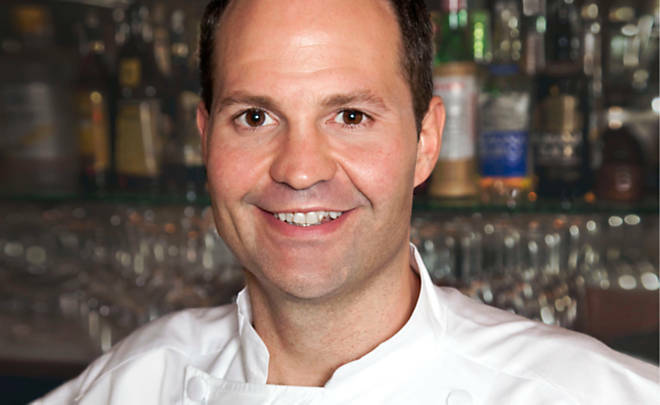 Chef Tilman of The Strand Bistro, The Strand Hotel, in New York City’s midtown. Chef Jason Tilman underwent the culinary equivalent of Navy Seal training, working with Iron Chef Morimoto and David Burke before racking up Best New Restaurant Awards for venues he opened solo. 2. Make the foie gras stuffed prunes: Cut the terrine into small dice pieces and stuff in the prunes. Set aside. 3. Preheat the oven to 350 degrees F. Using a spice grinder (or mortar and pestle) grind the coriander seeds until fine. Sprinkle the coriander generously over the lamb and season with salt and pepper. 4. Heat a cast iron skillet over medium flame. When hot, add oil. Carefully place the lamb in the skillet and sear for 3 minutes on each side. Add the butter and thyme. Baste the lamb. 5. Place the skillet in the oven for 6 minutes, for medium-rare. 6. Remove the lamb and place on a cutting board to rest for 5 minutes. Meanwhile, warm the sauce then add the foie gras stuffed prunes to gently heat. 7. When ready to plate, slice the lamb into medallions. 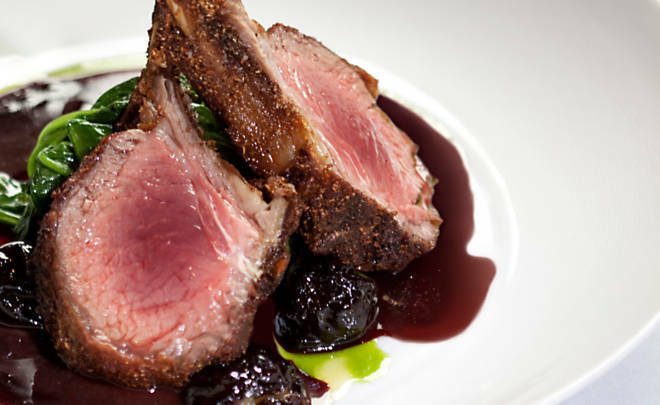 Serve with port wine reduction, foie gras stuffed prunes and sauteed spinach or the greens of your choice. The Strand Hotel is a fashionable, independent hotel in Manhattan’s Midtown, with views of the Empire State building, quiet, plush rooms, Stash points for free nights, and good food.